Parkinson’s disease is a neurological disorder that affects motor skills. The nervous system is like a communication center and helps one make sense of what is happening inside and outside the body. Parkinson’s disease usually begins when a person is in his/her 50’s or 60’s. The cause is unknown at this time. Parkinson’s disease touches every area of the individual’s life. Care partners and family, especially spouses, are also affected. Knowledge of specific training and holistic approaches are key to providing the best services to persons affected by Parkinson’s and their family members. The symptoms of Parkinson’s are caused by over-activity or under-activity of cholinergic or dopamine (chemical messengers in the brain). Treatments mainly address issues of mobility including slowness of movement, freezing, rigidity and stiffness and involuntary movements. Medication reminders are very important here relating to time sensitivity of the peak time due to the drug. Encourage the client to use assistive devices for walking. Homewatch CareGivers offers In Home Care Services for Parkinson’s Disease Patients throughout Chicago and the North Shore suburbs including both Cook County and Lake County. We provide our home care, senior care and dementia care services to residents of Arlington Heights, Buffalo Grove, Chicago, Deerfield, Des Plaines, Evanston, Glencoe, Glenview, Highland Park, Fort Sheridan, Highwood, Kenilworth, Lake Forest, Morton Grove, Niles, Northbrook, Park Ridge, Lincolnshire, Lincolnwood, Libertyville, Skokie, Wilmette and Winnetka. 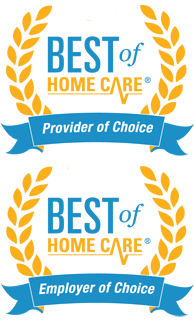 As part of the Homewatch CareGivers nationwide family, we are backed with the resources of one of America’s largest and most trusted home care service organizations.